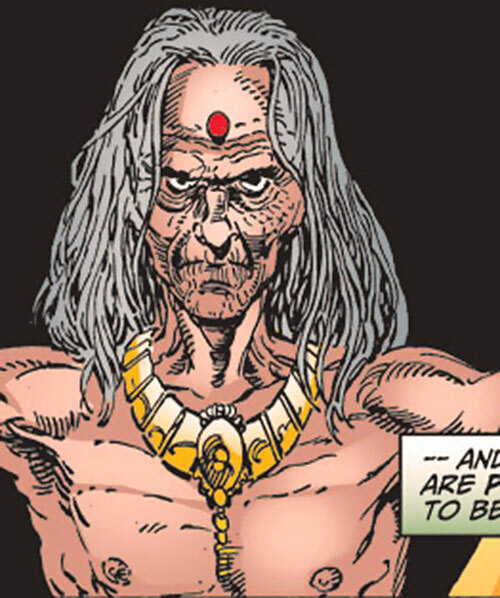 Kulan Gath is an ancient sorcerer in the Marvel Universe. He originally appeared as a Conan the Barbarian foe in 1972. 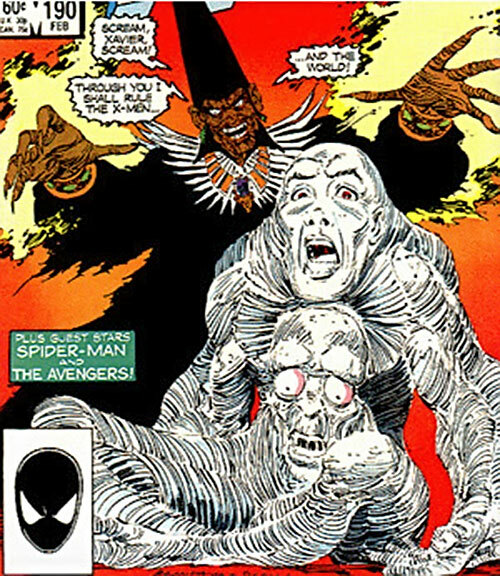 However, he gained much of his fame when he started interacting with the *modern* Marvel universe. 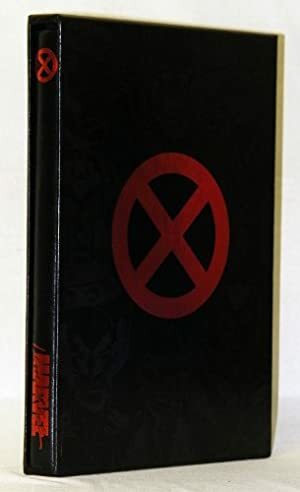 A classic, fondly-remembered example of this was the 1985 X-Men “An Age Undreamed Of” story arc. 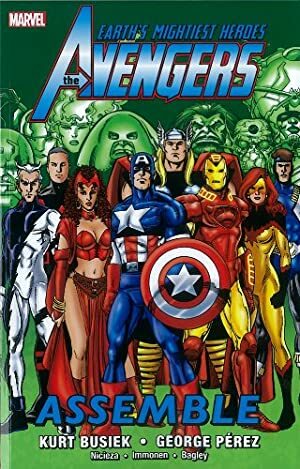 This story established Gath as a major menace even for super-heroes. Known Relatives: Vammatar the Witch-Queen of Hyperborea (former wife), Armati the Priestess of Ormuz (former wife). Base Of Operations: Formerly Stygia, Yagala, Zahmann, Mount Crom, New York, Costa Verde. Height: 5’11″ Weight: 130 lbs. Kulan Gath possessed the ability to tap into and manipulate magic on a level approaching that of the Earth dimension’s most powerful mage Doctor Strange. Transform entire cities and their populations into Hyborian Age equivalents. Project lasers of mystical force. Manipulate and restructure flesh and bone. On occasion, Kulan Gath animated a “Bone Dragon” for long distance travel. All of Kulan Gath’s Powers and essence reside in an enchanted amulet/necklace. His spirit can safely reside within the amulet if his body has been destroyed. This allows him to possess and transform whoever wears it into a likeness of himself, making him effectively immortal. However, this influence can be resisted by those possessed of a sufficiently powerful will. If the necklace is properly contained or abandoned in a sufficiently remote area he is trapped without the means to influence the outside world. While in Kulan Gath form he can cast rejuvenating spells on himself that keep him healthy. Yet he is still unable to transform himself into a younger physical form except by illusion. Kulan Gath looks like an ancient priest clad in a grey robe, golden bracelets, ornamental shoulder pads and miter hat. His brown-skinned body appears to be far older than any mortal man’s, giving him a zombified appearance. His eyes are glowing with power and his nasty smile is pure evil. Around his neck he wears a beautiful, golden, mystical necklace. This is the amulet to which he has bound his lifeforce. Before his first death, he appeared to be a handsome man with Egyptian or perhaps Indian features. Few men can compare in pure evil to Kulan Gath. His diabolical ruthlessness is usually a shock for his enemies. In many respects he is more evil than the demons he summons. He hates do-gooders with a great passion and enjoys taunting everyone with black magic. He will, of course, bring great vengeance on those who have stood against him or fought him. This will include thorough torture and possibly crucifixion. Unusually enough he is sufficiently powerful enough to do this to Marvel’s heroes. 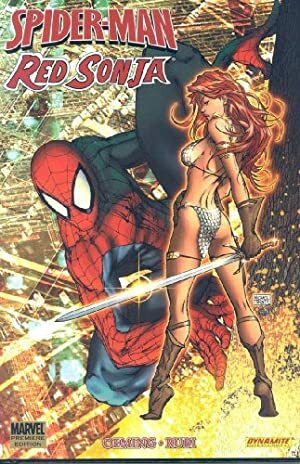 When transforming Manhattan Island into a Hyborean world, he chose to exclude Spider-Man from the effects so that Spider-Man could remember everything. Then he would be trapped and hunted at Gath’s pleasure. His goal seems to be to rule a dark, magic world of his own creation with an iron hand. He intends to have his old castle, a throne and a court of minions and guards, as well as a harem of women and prison dungeons with trapped and tortured heroes. He enjoys torture, random killing and sacrifices, in particular children, to the gods. Despite being a zombie-like sorcerer with serial immortality, his looks are of little importance to him. What is more important is the desire for ultimate power, control and respect. The barbaric culture of the old Hyborian world suited his tastes just fine. Clearly, he feels out of place in the modern world. The first thing he tries to accomplish when he returns is to recreate the Hyborean world by magical means, in particular recreating the architecture of the greatest era in Hyperborea. As the first step in converting the world to his image, he usually builds up an army of mind-controlled, superpowered guards, that he refers to as his Hellhorde. Gath has one big problem with his current existence. He feels that his transformed city should be the most spectacular city in the world, and yet, it’s a backwater, dwarfed by the modern age. The world is so changed compared to his native time — so big, so noisy, so foul — that it overwhelms him. Thus, the recreation of the Hyborean world is Gath’s way of coping with reality and life. And so, in retrospect, he feels that he should have reached a final reward in his time. Gone on to become a god. But now, the gods are gone, and the gates to their realms have been closed and lost. Still, he has earned it, and he will become a god in the modern age. He will sacrifice the whole world if that is needed to attain godhood. 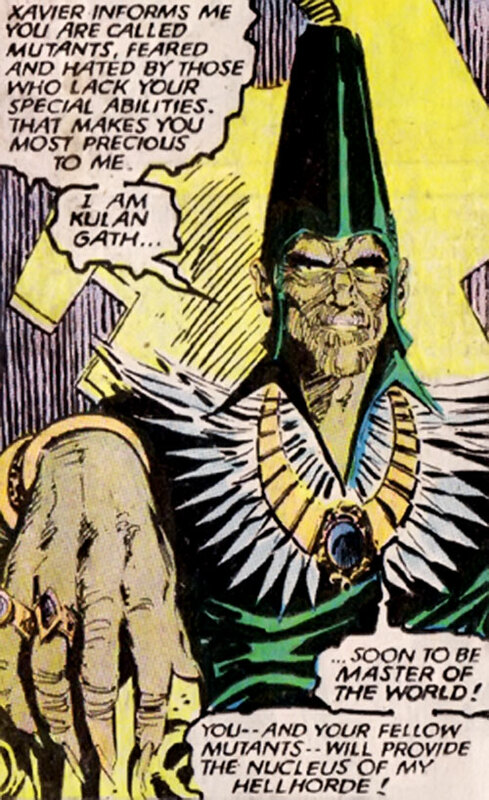 Somehow Kulan Gath reminds me a lot of Ian Karkull, so perhaps they are the same person in the DCU. They both aspire to immortality, are very powerful and very evil. They are similar enough in many ways to be brothers. Of course, neither of them would accept rivalry on their power scales, and a war between them could be devastating enough to be an adventure in itself. Mutation uses effects according to the Player’s choice (+1). Sorcery is often used for Broadcast Empath, Control, Dimension Travel, Earth Control, Flame Animation, Mystic Freeze, Neutralize, Plant Control, Telekinesis and Teleportation. Iron Nerves, Languages (Hyperborean, Stygian), Magic Background, Magic Rank (Master of Demonology, Immortality Magic and Necromancy), Scholar (Demonology), Scholar (Immortality Magic), Scholar (Necromancy). Demons/Chaos (Mystic entity, High), Set the Serpent God (Mystic entity, High), Shuma-Gorath (Mystic entity, High). Distinct Appearance (Zombie-like sorcerer), Loss Vulnerability (Loss of 4 column shifts of all Powers and Ritual Effects; Loss of his Mystic Amulet). Scrying Glass [BODY 02, Remote Sensing (ML): 14, R#2]. Mystic Amulet [BODY 07 SPI 20, Invulnerability (ML): 20, Personality Transfer (ML) 20, Immortal, Boni: Kulan Gath’s lifeforce can be stored in this amulet if his physical body is destroyed (+5), but only his Hypnotism can be used on any subject physically close to the amulet (+1)], Limitations: Personality Transfer has a Range of Touch only (-1) and can only be used on a mesmerized subject donning the amulet, thus transforming him into Kulan Gath (-1). All attempts of Hypnotism against subjects that are not evil or greedy will suffer a +2 CS OV/RV (-1). Notes: The mystic amulet thus stores Kulan Gath’s soul if his physical body is destroyed. However, he is then trapped in that object, until someone dons the amulet, as mentally suggested by Gath. Upon donning the amulet, the subject physically transforms into Kulan Gath, apparently forever. There are some hints that the amulet may, in fact, be indestructible, in which case its BODY should be increased to 20 APs]. Necessary Components: Crayons or other inscribing tools. Note: Gath usually places these around his place of power to alert him of any newcomers passing his domains. Necessary components: Human child sacrifices. Notes: The ritual is used to recreate the Hyborean world in modern times, reshaping everything in the city, including the buildings (skyscrapers and brownstones turn into fortresses and minarets), technology (cars turn into chariots, street lights into torches, guns into swords), clothing (uniforms turn into guard clothes) and food (processed food turns into mead and raw meat, into old Hyborean style. People become loyal subjects to him, start speaking Hyperborean, and live on in the new barbarian society. People also forget about their old modern lives and believe the whole world outside is like the Hyborean world. The ritual does not change personal relationships; friends remain friends, families remain families and groups remain groups. Sometimes people’s Powers are changed into the appropriate classic version. The Area of Effect of the spell is 13 APs in total, just enough to encapsule the whole of Manhattan Island, but can be increased by further sacrifices. The affected area is marked by a green energy wall, or invisible if Gath so chooses; the green wall is treated as if it had Darkness of 12 APs for seeing through it, although everything is clearly visible from the air above it. Anyone entering the area will immediately be affected by the spell. 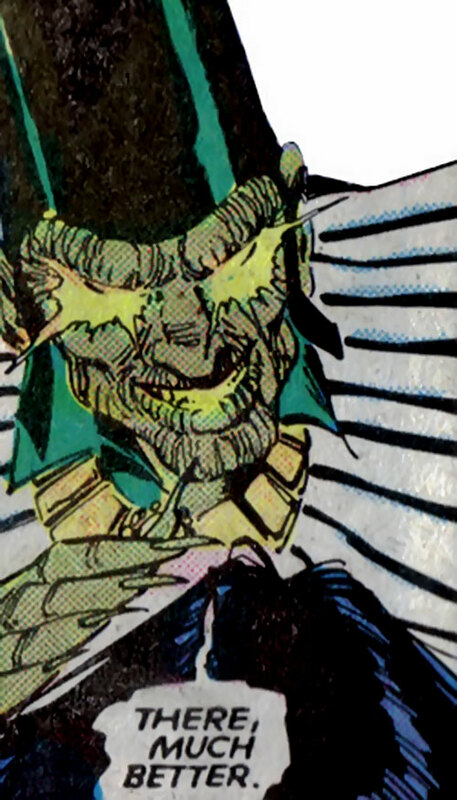 When casting the spell, Gath can choose to exclude people within the area of effect from being affected by the spell, such as he did to Spider-Man. The spell remains controlled by whomever wears Kulan Gath’s Mystic Amulet. It also appears as if one Automatic Action is needed to support the spell each turn. Although an inconvenience, Gath can sleep and occupy himself with other things while the spell is active, apparently indefinitely. 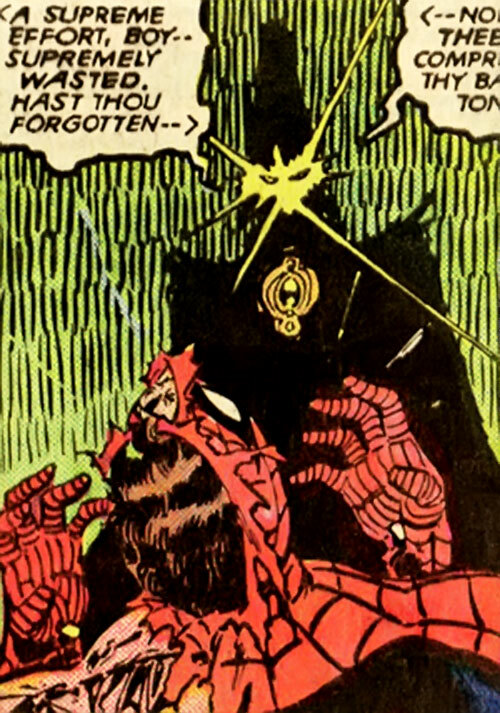 Gath also has access to a large number of forgotten rituals going all the way back to Atlantean times that bring chaos and terror to the world. Although these have not been clearly demonstrated, he can cast spells related to demonic summoning, soul sacrifices, necromancy and mind control. Ritual Casting such spells is simplified by 2 column shifts on the OV/RV courtesy of him having the appropriate mystic entity connections. The Hyborian world lives again ! Kulan Gath regularly employs an extremely powerful spell, his master spell, that remakes an area equal to a larger city into the Hyborean world. Kulan Gath is most at ease in the old world, and casting the spell is usually the first thing he does when reborn into the world, to create himself an area of power. The whole area in which the spell is cast immediately becomes a magic area which, in game terms, means that all Rituals are cast at -1 CS OV/RV, and in addition, Gath’s BODY score is increased to 6 APs. In this newly created, magical pocket realm, Kulan Gath is Sorcerer Supreme, and gains an increase to his Sorcery and Occultist scores by 4 APs, as well as 1 AP to each of his Mystical Attributes. Probably based on the magic of Set, Gath throws his master spell at -2 CS OV/RV due to his high level mystic connection to this entity. This mythic Ritual is not easily described in game terms, but an approximation would be as described above. 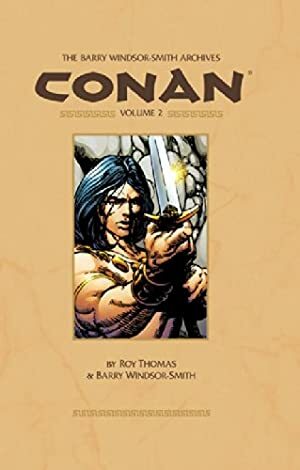 The classic enemy of Conan the Barbarian during the Hyborean Era had not yet devised his master spell, “the Hyborean World” spell, and neither was there any need for it. 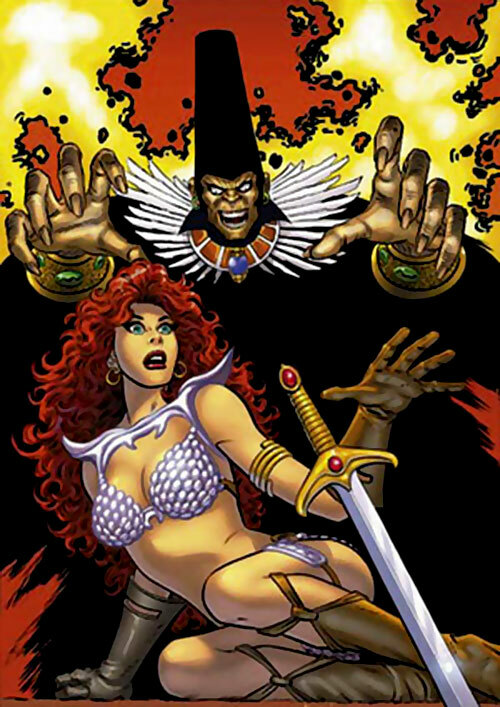 In addition to the stats above, he possessed Area Knowledge (The Hyborean World) and had the Enemies Drawback (Conan the Cimmerian, Selene the mutant sorceress and many more). He also had the following Connections – Armati the Priestess of Ormuz (High), The demon Ormuz (High), The N’Garai demons (High), Razal Gulath (High). His HP were reduced to 75. (Cost equal to a Powerful Connection plus 5 HPs for every two Powers listed). The benefits of invoking entities fall into two categories. The first is an AP boost for Powers. If a Power is used while invoking the appropriate entity, a Low Connection garners a +1AP to the Power, while a High Connection gets + 2APs. If Sorcery is being used to mimic the Power in question, calculate any Mystical Bashing Damage by the APs of the Power BEFORE the boost. For example, a sorcerer with a High Connection to Agamotto who invoked him before mimicking an Energy Blast with Sorcery could use a 10 AP Blast but only take MBD as if an 8 AP Blast were used. The second benefit applies to rituals. Any Ritual that invokes an entity decreases the OV/RV for Ritual Casting by 1CS for a Low Connection and 2CS by a High Connection. Set the Serpent God (-)(High): Benefitting Powers unknown, at least the “Hyborean World” Spell. Shuma-gorath (-)(High): Control (vs. Demons only), Energy Blast, Magic Blast. Demons/Chaos (-)(High): Any Spell related to Demonology.